Kit (Doris Day), a wealthy American married to London businessman Tony Preston (Rex Harrison) becomes the terrified victim of a mysterious stalker, whom she hears but can never see. She is threatened by the eerie, high-pitched voice as she walks in the thick London fog. She then begins receiving repeated threatening telephone calls. The now totally panicked Kit is nearly killed when someone pushes her in front of a bus. The only one who seems to believe Kit is Brian Younger (John Gavin), a construction foreman, but Kit is not convinced that she can trust him. The tension builds to a thrilling climax as Kit flees for her life on a scaffolding outside her apartment building. To say any more about the plot would detract from the whodunit or who is doing it kind of ending. Suffice it to say that Midnight Lace is an exciting thriller, with many surprising plot twists and a sinister performance by Rex Harrison. It has been said that Day's astounding performance recalled for her too many of the sad elements in her personal life and in previous marriages. Because of that, she chose to stick with comedy throughout the rest of her career in films. Tony Preston: Take Bea. She's a gay soul. At least you'll have a chuckle or two. Kit Preston: That's the way I've always dreamed of going to Venice. The moon on the Grand Canal, and the gondolier singing, and Aunt Bea beside me... chuckling. Brian Younger: Before the war I planned on being an architect. But that meant an office and four walls. I even sleep out under the stars whenever I can. Camping trips and things like that. Kit Preston: That's fine if you're married to a Girl Scout. Kit Preston: Don't ever change. No songs were sung in this movie, just background music. "What Does a Woman Do"
"Dictating his memoirs near the end of his life, Rex Harrison barely mentioned Midnight Lace except to say that he wasn't fond of the script. He also (falsely) reported that Doris Day was under so much pressure to make the picture work that she collapsed. Day was indeed under strain, though it was due to her personal form of method-acting that caused her breakdown, not from the script or the production." Advertised on a theater marquee under its Spanish title "Un grito en la niebla". "The white gown that Doris Day wears is the same dress she wore to the Oscar ceremony for her nomination in Pillow Talk (1959)." "The working title of this film was Matilda Shouted Fire. 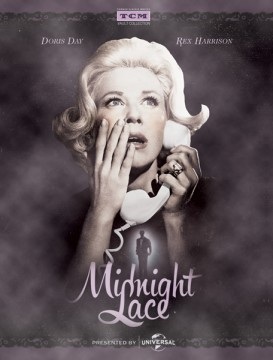 Midnight Lace marked the second co-production of Universal and Arwin Productions, which was owned by Doris Day and her then-husband, producer Martin Melcher. According to a October 26, 1959 'Rambling Reporter' item in Hollywood Reporter, Day quit the Columbia production of Who Is Sylvia (which was never made) in order to star in Midnight Lace." 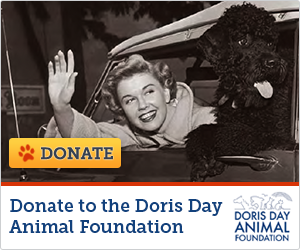 "In her autobiography, Doris Day wrote that to prepare herself for one of the terror scenes, she recalled a time when her first husband, trombonist Al Jorden, dragged her out of bed when she was ill and pregnant and hurled her against a wall. Day related that in the scene she wasn't acting hysterical, she WAS hysterical, and at the end of the take she collapsed in a real faint. She was carried to her dressing room, and producer Ross Hunter shut down production for a few days while she recovered."